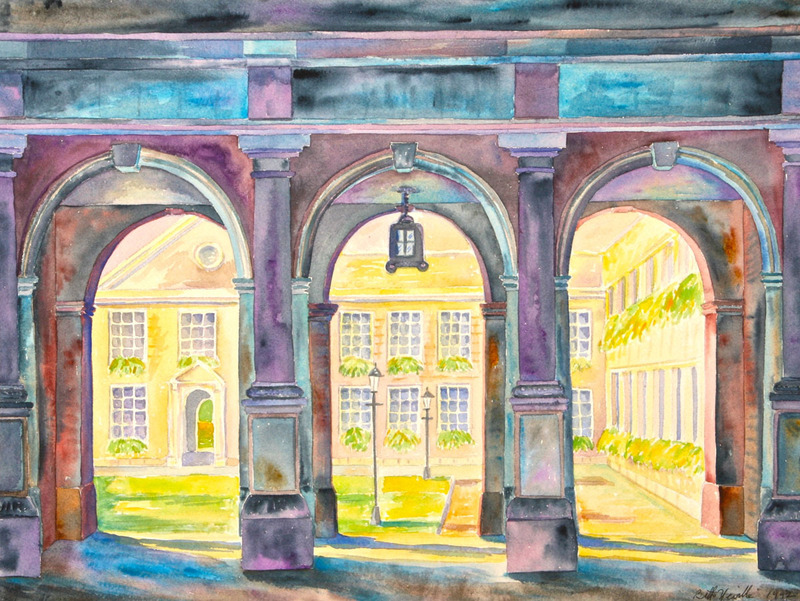 The watercolors on the web site are grouped by topic and subject, not by date. The theme of “earth, air, fire, water,” dominating much of my oil and acrylic painting, has also been important in selecting watercolor topics. Volcanoes, floods, monolithic rocks, sunsets, rolling fields, and trees are major themes. Another theme is arches in buildings or walls. 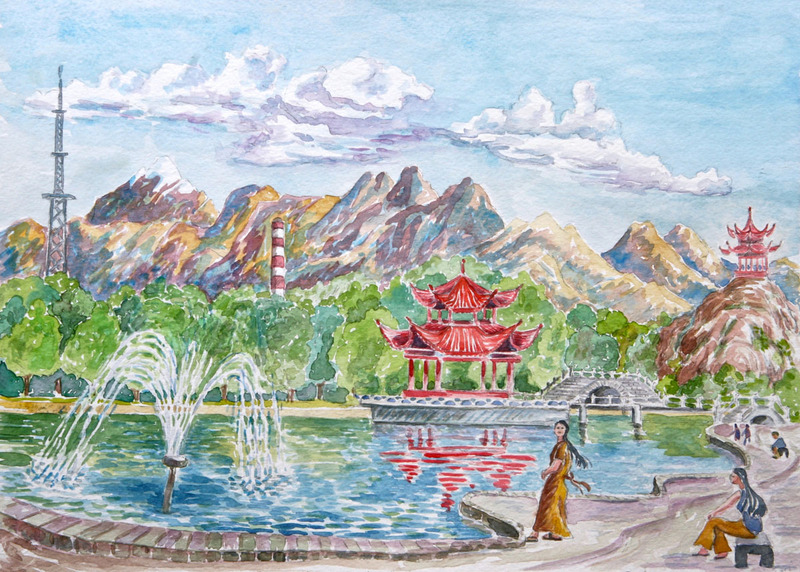 I also have painted famous lakes in Urimqi and Beijing, China, and city plazas in London, Cambridge, Stockholm, Xi’an, and Honolulu. 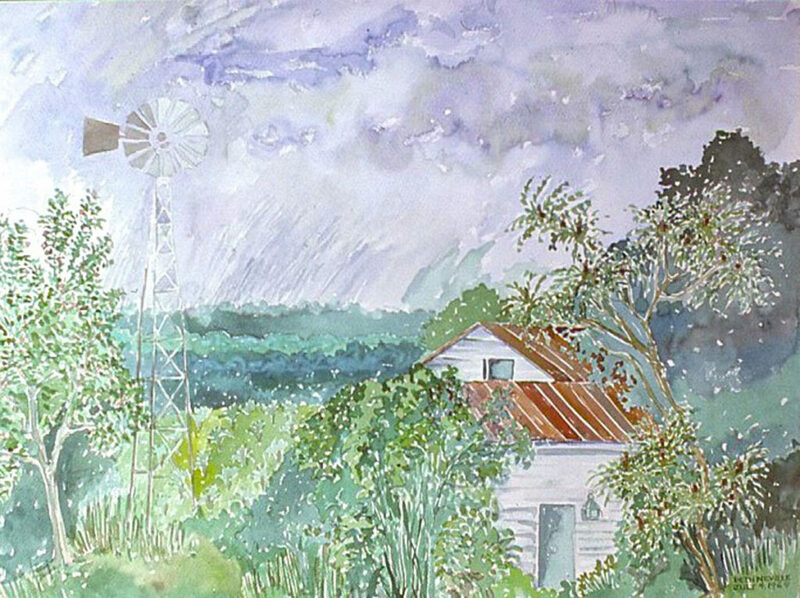 Two other watercolor themes, posted elsewhere on my web site, are Fruit and Flowers, and Portraits. “Mt Etna” (01) drawn from a cruise ship in the Mediterranean. “Eyjafjallajokull” (02-03) Iceland, drawn from photographs of the explosion. 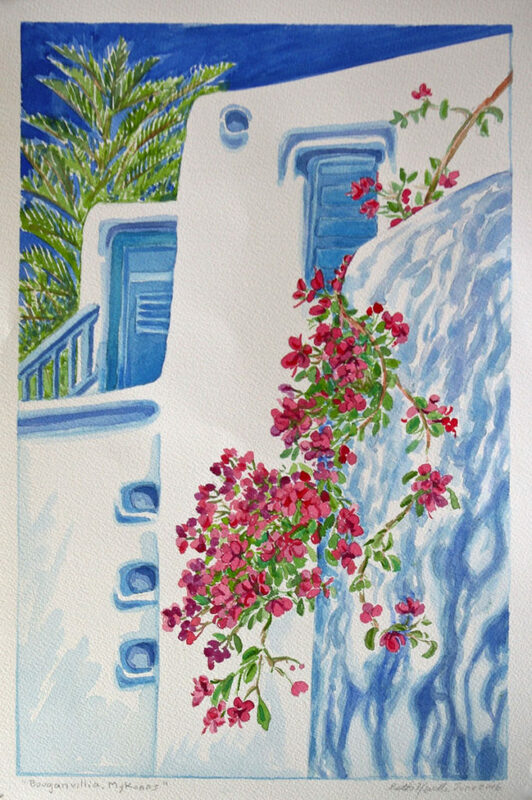 “The Volcanic Mountains of Rhythemno,” (04-05), Crete, Greece, drawn from the hotel balcony. “Mauna Laua Caldera,” Hawaii, drawn standing on the edge of the crater (06). The high-water mark “Floods of the L’Aude River,” France, drawn from the wet river banks (07-08). 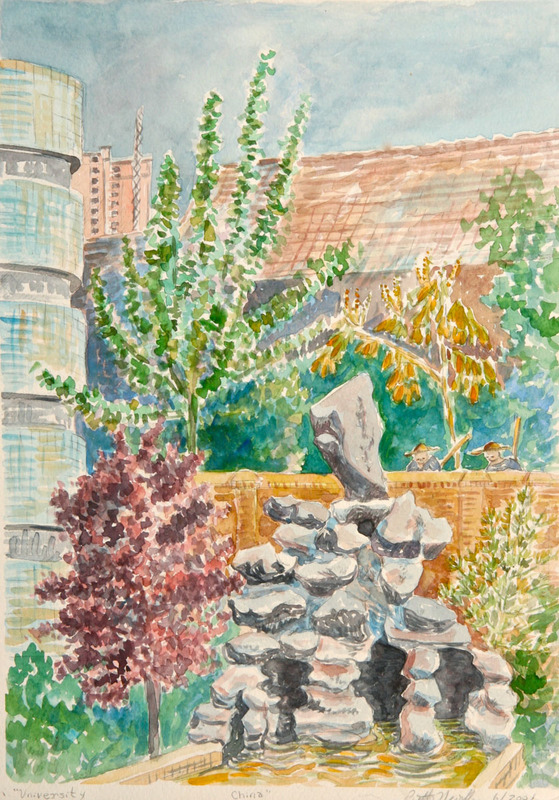 “Flooded Streams,” University of Hawaii, Honolulu by the East West Center, drawn sitting on the rocks (09, 10, 11). 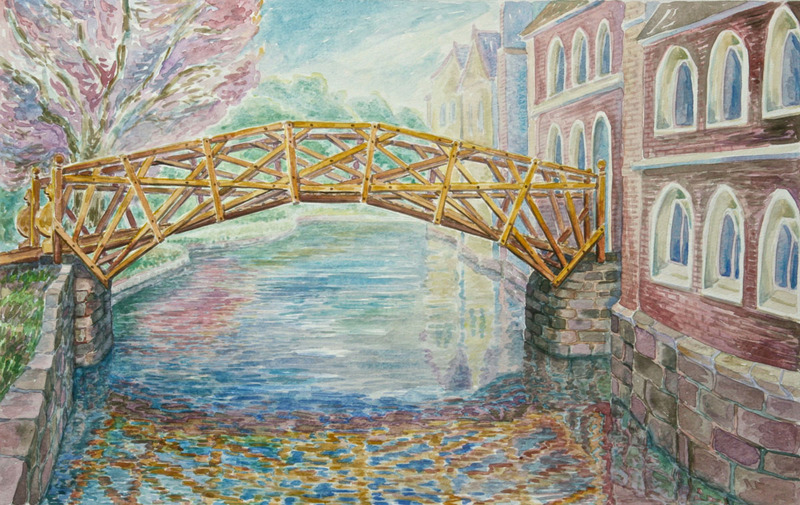 “Neponset River Flood,” Milton and Dorchester, MA, drawn leaning on the bridge railings over the river (12, 13, 14, 15). “Uluru/Ayers Rock,” Central Australia, drawn while sipping Champagne on a nearby plateau (16). “Coles Bay Monoliths” (17), “Jim-Jim Falls” (18), “Rocky Shores,” Freycinet Bay, (19) Australia, drawn on location. 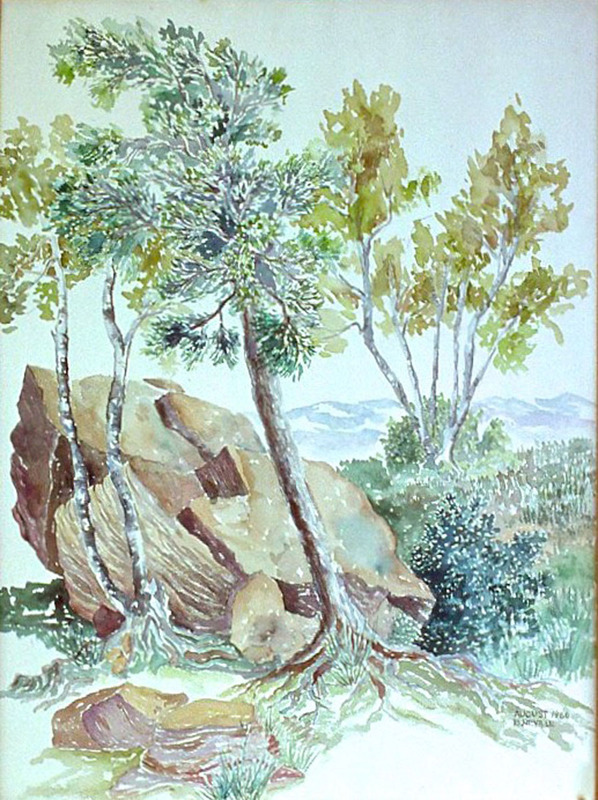 “Massive Rock” Garden of the Gods, Colorado Springs, CO, drawn while walking through the park (20-21). ”Desert Palms,” Coachella Mountains, CA, drawn standing on a busy highway sidewalk (22). “Maine Coast” (23), “Brant Point Light,” Nantucket, MA (24), “Sunset,” Key West, FL (25), scenes dawn from rocky shores, hills, and boats. “Fog, Fall,” VT (26), “Sunset, Fall Foliage,” ME (27). “Rainy Day, Chatham Lighthouse,” Cape Cod, MA (29), the best watercolor I ever painted. I sat on a wet sandbar to paint it. “Sunset, Ojai,” CA (30) drawn from a resort veranda. “Meadow Greens Golf Course,” Ghent, NY, painted from the porch (31). “Pamplona Park,” Spain, drawn sitting on a bench (32). “Arga River Valley,” Pamplona, Spain, drawn from a bluff over the river (33). “Alet les Bains,” limestone cliffs, France, drawn from a stone balcony (34). 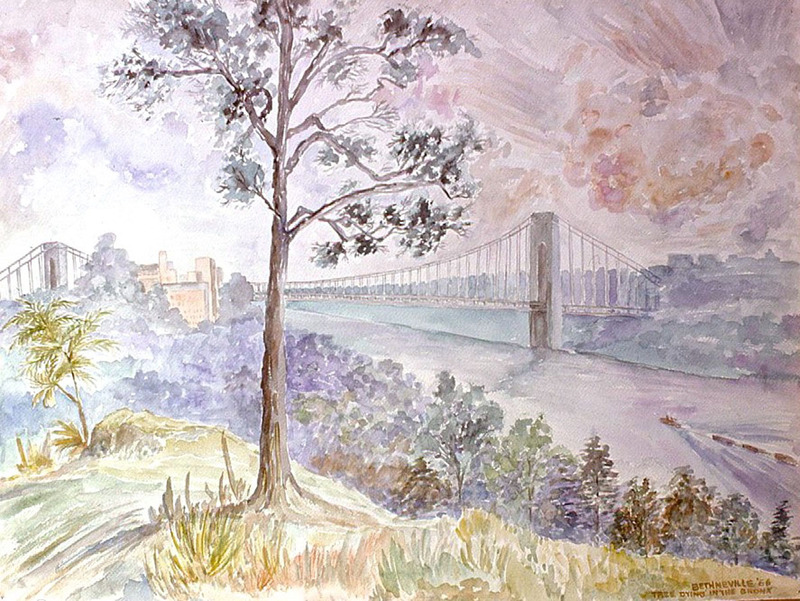 “Danube River Valley,” (two sections) Hungary, painted from a viewing park (35-36). “Pollard Poplars,” Alet les Bains, France, drawn from a hotel balcony (37). 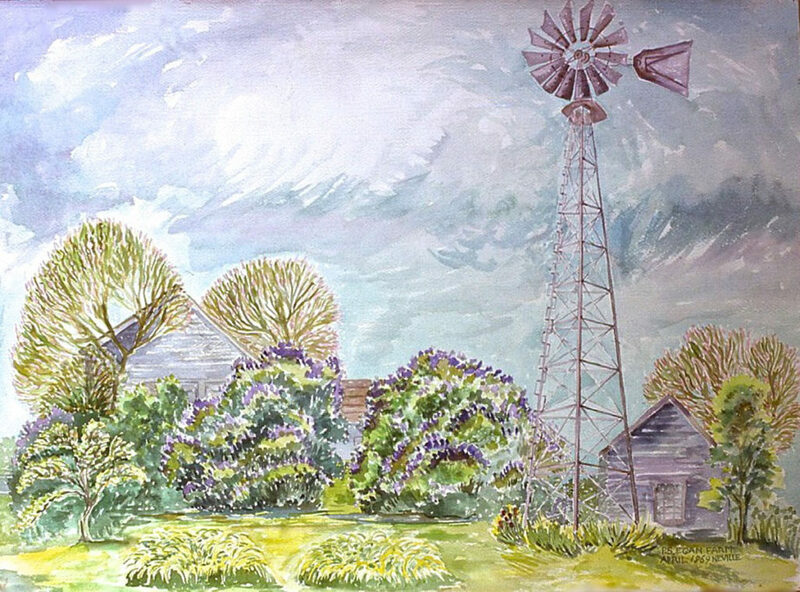 Living on an apple farm, trees were important and I painted them from teen-age years onward. (37-through-52.) Trees painted in snow (45, 46, 47), or with fall leaves(42, 48), trees dying (50), growing (49, 37), blooming (43, 51), some old and gnarled (38, 42), some tall and straight (39, 42, 47). Locations for painting trees: Alet les Bains, France; Ojai, CA; Venice, CA; Desert Palm, CA; “Russell Park,” London, England; Univ. of Hawaii, Honolulu, HI; Assisi, Italy; Lewis Parkway, Yonkers, NY; West Haven, CT; North Lake, Catskills Mountains, NY; Bronx, NY; and Claverack, NY. 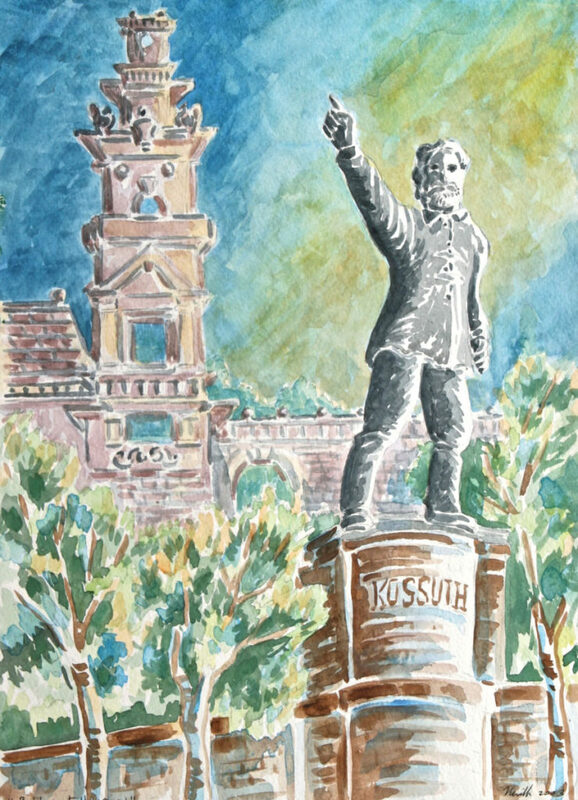 “Lajos Kossuth Statue,” Budapest, Hungary (53) is a monument I drew while waiting in line to enter a museum! 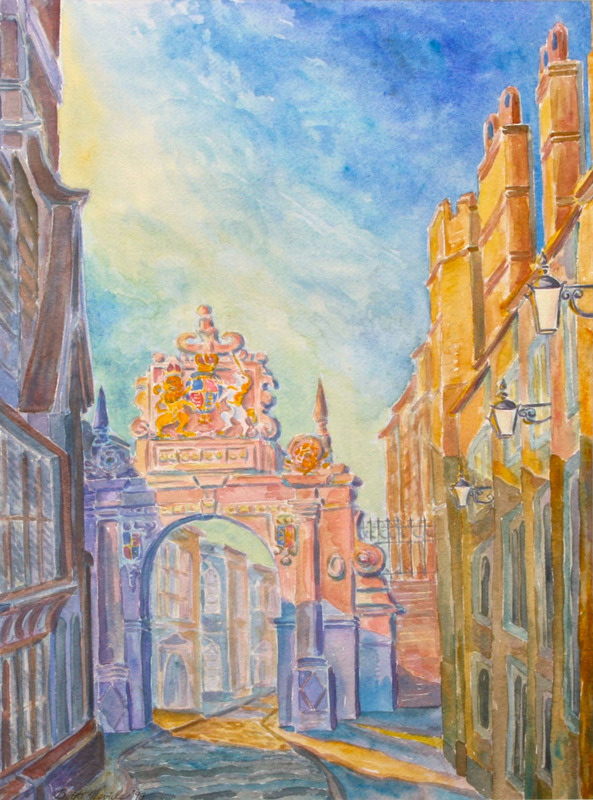 “Neville Gate,” Cambridge, England (54) is another favorite watercolor. 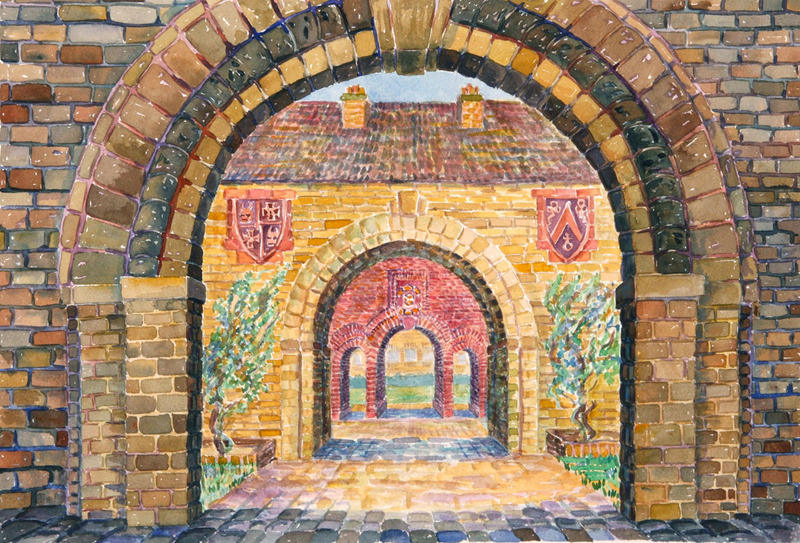 I drew it sitting on the sidewalk and can’t believe I got the arch and perspective down so accurately. 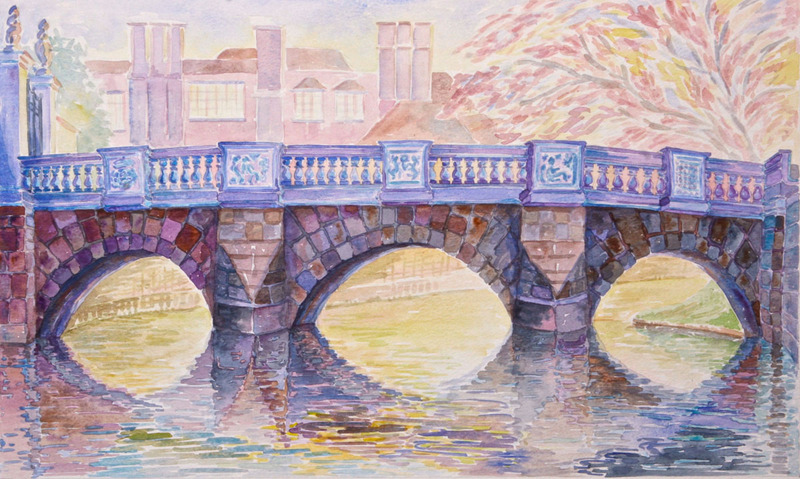 Cambridge University buildings, England, arches and bridges painted on several trips, all drawn on site (55-through 60). 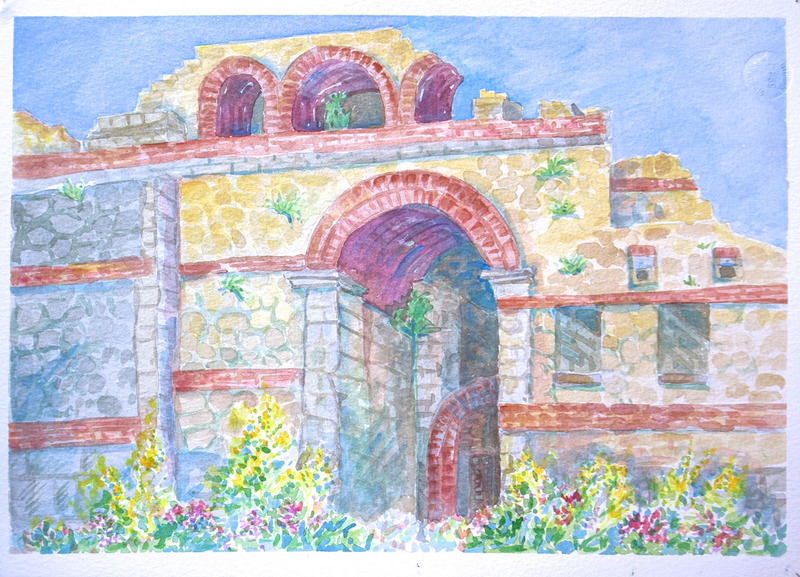 “Byzantine Arch” and walls, (61) Preveza, Greece drawn while the rest of the group explored the theater. 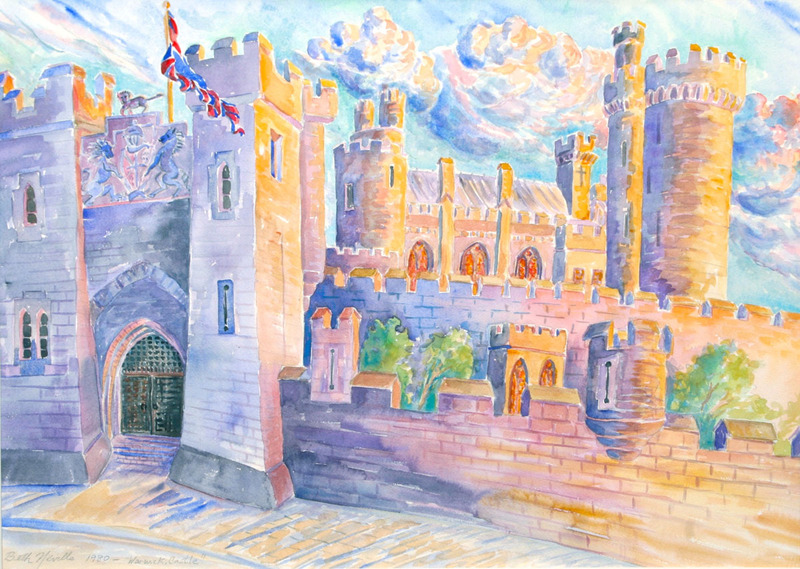 “Warwick Castle” (62) drawn from a photo. 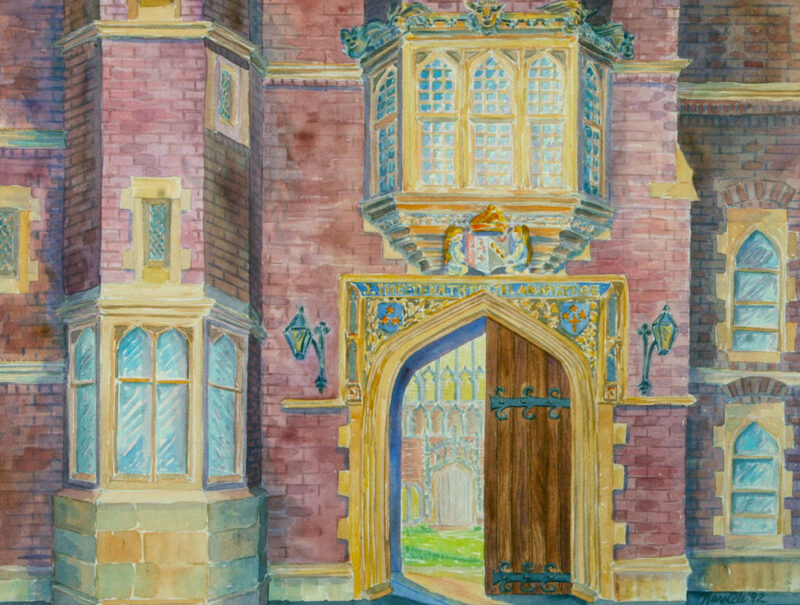 Robert’s ancestors were owners of Warwick estates and castles. Robert’s philosophical career lead to an interest in Asian philosophy especially Confucianism and Daoism. This resulted in multiple trips to China, Korea and Japan. 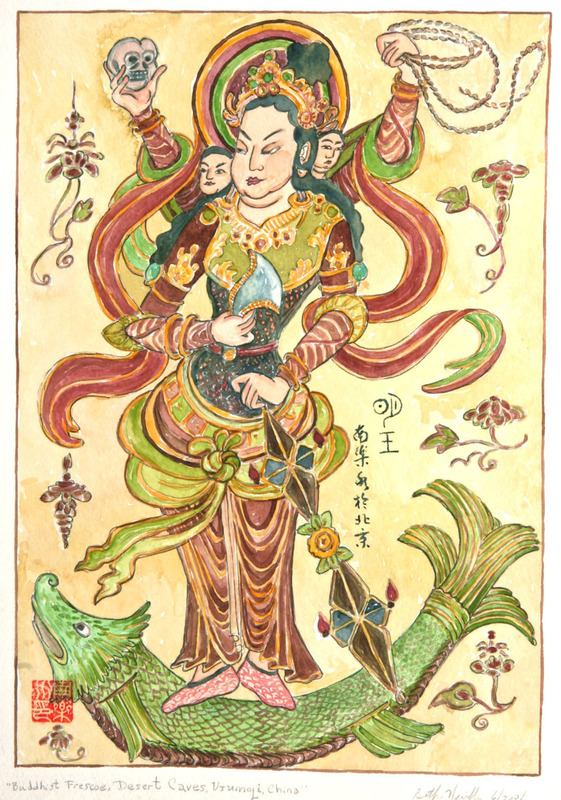 “Bezeklik” the goddess on the fish (63), is a watercolor based on an ancient desert cave painting in Turpan, near Urimchi, China. I drew it from print, after our visits to the caves. 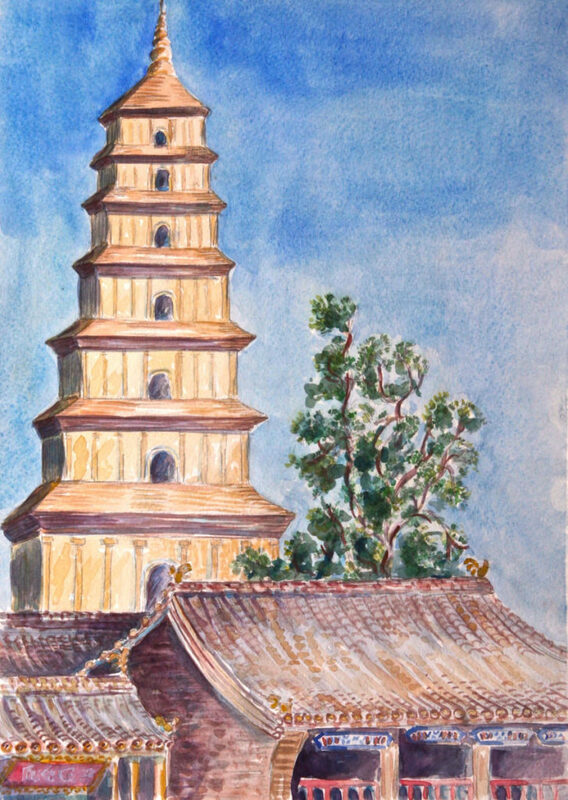 “Giant Wild Goose Pagoda” (64), Xi’an, China, is a personal favorite. On a previous trip I climbed to the top of the pagoda. So this time I sat on the ground and drew. Soon a Saffron-robed monk with bad teeth, came over and began talking excitedly about my work—in Chinese! 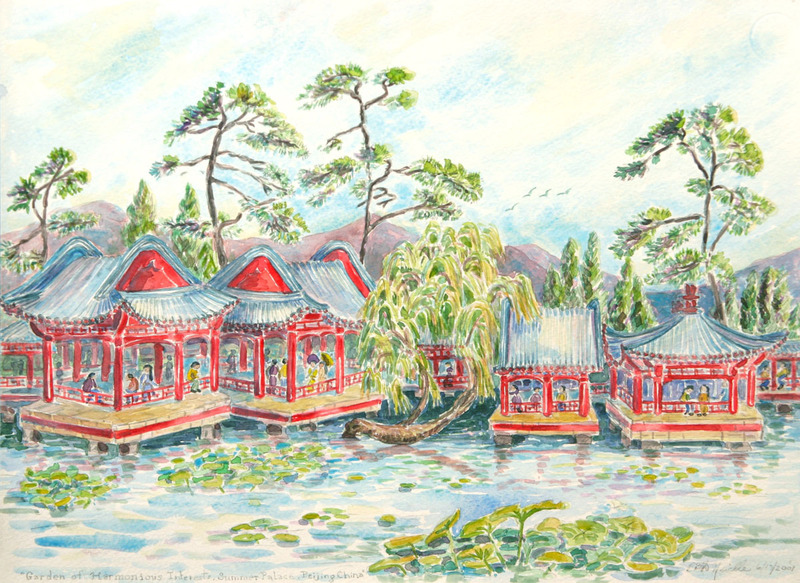 Beijing, Queen’s Park, (65) “Kunming Lake” and “Queen’s Summer Palace” (67), were drawn on the same day. 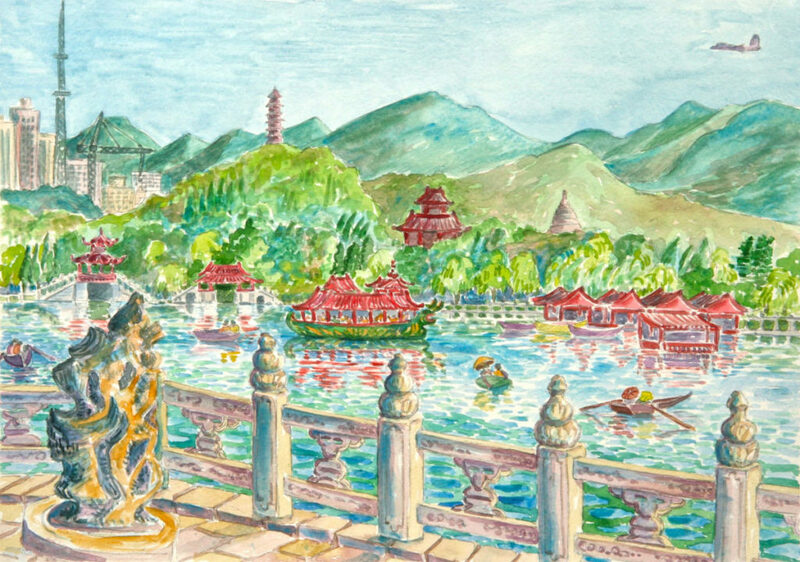 The Chinese tourist were fascinated to see me sitting there drawing the busy scene. But they especially liked my blond hair! They all wanted photos of me with their children, I was happy to oblige. “Lake at Xinjian,” (66) in remote Urimchi, tells a lot about modern China. In the background are the cell phone towers and a smoke stack. On one side of the lake is the obligatory red bridge. A water pump creates a “fountain.” Near where I was sitting, two elegant “ladies of the night” plied their trade. 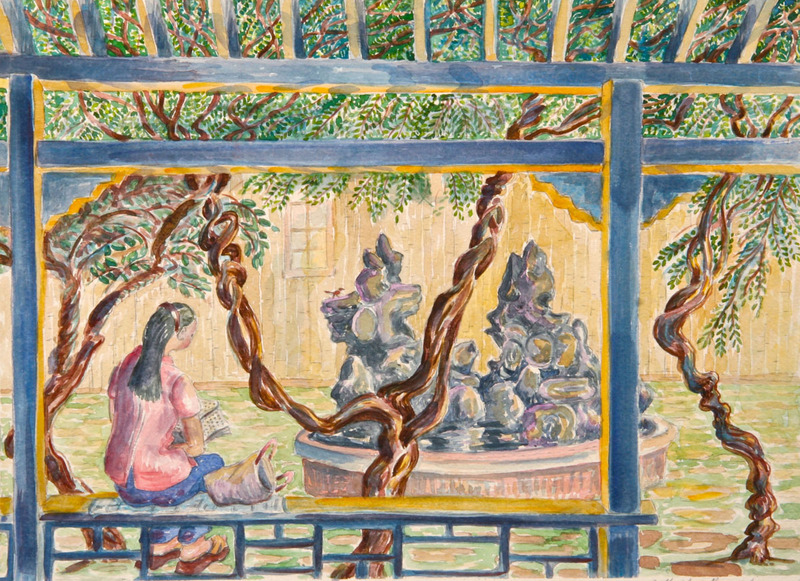 “Xi’an University, Student Reading” (68), and “Xi’an University, Grotto” (69) were drawn while Bob sat for hours listening to Chinese philosophers, in translation, with no water. 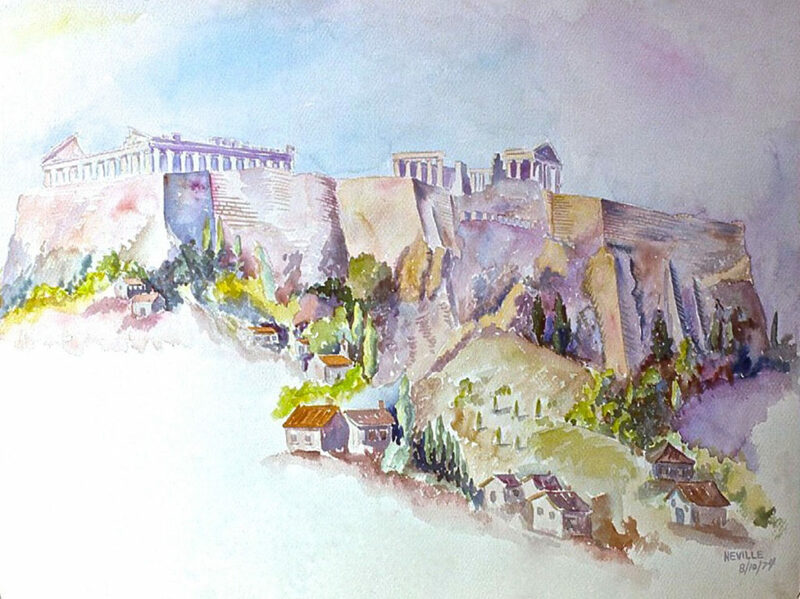 Years ago a trip to Greece yielded two watercolors, “Acropolis” (70) and “Temple of Athena” (71). 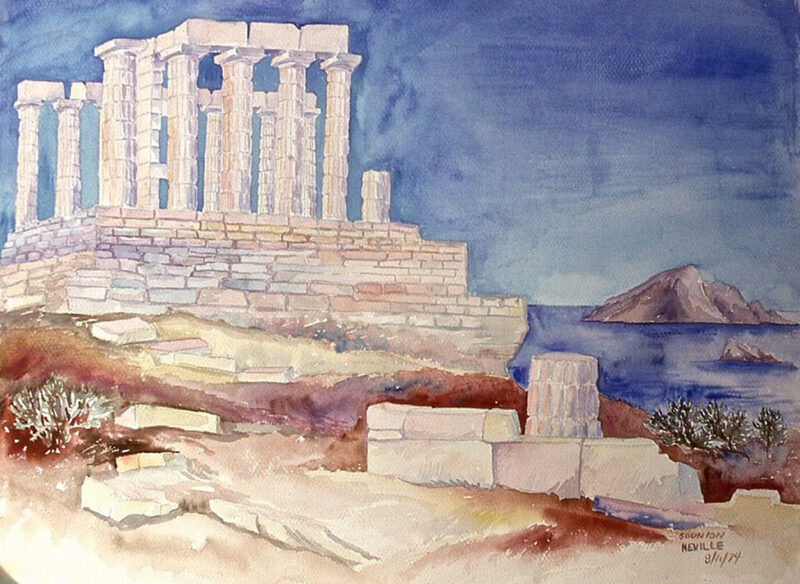 A trip “Turning Points of History,” in June 2016, resulted in watercolors “Column Sections, Acropolis” (72), five “Mykonos” paintings, (73 to 77), “Derelict Freighter” (78), drawn standing in a dock-side parking lot, “Harbor View, Valletta, Malta” (80), drawn from the hotel balcony, and “Ancient Greek Theater,” Syracuse (81), drawn from the stone seats. “Danube River” (79) is a memory painting based on the view out of the airplane window. 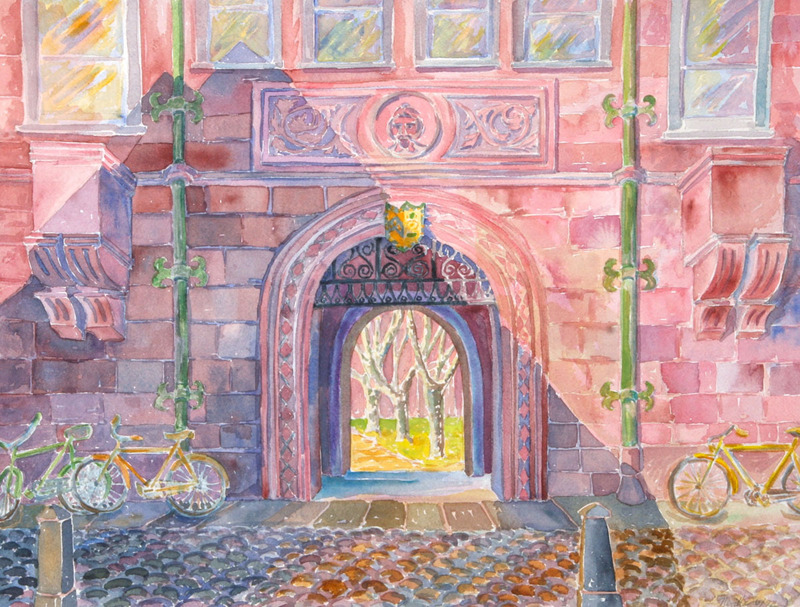 The last paintings are from various trips to Rome (82, 83, 84), “Florence” (85), “Assisi” (86), and “Gamla Stan” Stockholm (87). h 14" x w 18"
h 15" x w 11"
h 11" x w 15"
63 "Bezeklik Thousand Budda Caves, Figure,"Turpan, Xinjiang, China,"
hi 11" x w 15"